These biscuits are dang good! I can’t even count how many times I’ve made them, or for how many people, before finally remembering to snap a decent photo in order to share them with you. So, that’s my first order of business…apologizing for not getting this recipe out to you sooner! 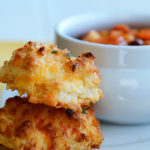 We’ve been eating these biscuits all week next to our all time favorite Pasta Fagioli soup! 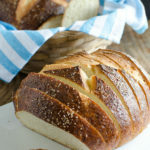 Look at those fresh, flaky layers! Seriously, can you resist? The trick is to not over work the dough. 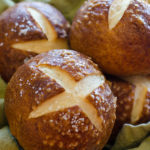 Gently roll it out and fold it two or three times, and then cut into individual biscuits. If you’re not a garlic or parsley fan, just leave out the seasonings as these will make awesome regular buttermilk biscuits as well. With such basic ingredients and extremely easy steps, these have definitely become a staple biscuit recipe in my household. Preheat oven to 425˚F. Line a large baking sheet with parchment paper. Stir together the garlic and parsley in a small bowl; set aside. In the bowl of a stand mixer fitted with the paddle attachment, mix the flour, sugar, baking powder and salt. Add the garlic and parsley mixture. Blend in the cold butter until the mixture resembles coarse crumbs. Pour in the buttermilk and milk; mix until just combined. Do not over mix. On a floured surface, roll the dough to a 1-inch thick square. Fold the dough in half, turn it and roll it again into a 1-inch thick square. Repeat one more time and then gently roll one final time into a 1-inch 9×9 square. Use a biscuit cutter or knife to cut into individual portions. Place the dough on baking sheet, brush with milk and bake for 10 to 15 minutes. these look so good! i’ve bookmarked them! i have some buttermilk in the fridge right now so hopefully i’ll have time to try them out this weekend! they look fabulous! Wow these look spectacular! They really rose in the oven! So glad you liked my recipe! I agree that it’s a great one and I am flattered you chose to adapt and write about it. Your biscuits look just beautiful! Very nice blog you have here! Nikki made these for us this past weekend when we flew to Chicago for Judah’s baptism, and they are wonderful, so full of flavor, and a great compliment to the Pasta Faglioni! I guess I didn’t spell that right. These look great. 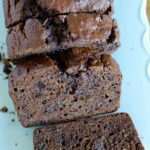 I bookmarked these – I am going to make them soon! 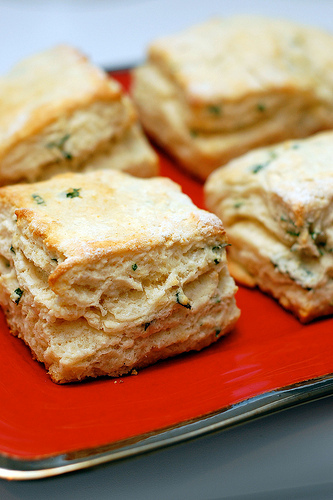 I love garlic and herbs in biscuits, so thanks for sharing the recipe! So good they are. I used apple sauce instead of sugar. Butter shortening as well. Didn’t have parsley so used fresh oregano. Perfect with the meal. Sprinkled steak seasoning and Parmesan worked well with my vegetarian country meal of Salisbury vegan steak and mushroom gravy and onions. Mashed potatoes and a corn and Brussel sprouts melody.